Windows 7 is now up to about 45% of the user base, a gain of almost 17% since last time. XP has fallen further to less than 40%, which is a drop of almost 9%. Vista has also fallen, by about 14% down to 15.5% total. 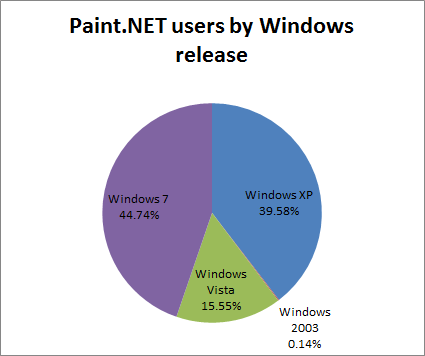 An important sum here brings the total of Win7 + Vista to just over 60%, which is the percentage that will be able to run Paint.NET v4.0 upon its release, which will require Vista SP2 as I’ve stated before. 64-bit adoption has also grown another 16% and is now more than 1/4th of the user base, a trend I’m still very happy to see continue. I highly recommend running 64-bit Windows 7! It really is the best configuration for running Paint.NET, and my personal favorite of the 3 major editions of Windows that Paint.NET v3.5.x supports. The percentage of Russian users continues to gain steadily as well – by almost 20% since September! Other than that, there isn’t a whole lot of change worth mentioning in the rest of the stats. Work on Paint.NET v4.0 is progressing steadily. I’ve recently added support for the Windows Animation Manager, and have employed it in the image thumbnail list to very good effect! Scrolling and fading animations seem superfluous on first discussion, but they really add to the polish of the application, and I’ve found they even improve perceived performance. I’ve found that interleaving creative and technical work helps to keep things more interesting. I’ve been doing some additional work to enable better use of Aero Glass, such as rendering the image thumbnails up into the title bar area. I’m also considering a public release of pre-alpha builds, in order to get early and important testing and validation of the new .NET 4.0 platform and related installation changes. Maybe I’ll be able to do this by March! There won’t be a big chunk of new features (compared to v3.5.x), but from a “scientific” standpoint this is a good thing. Testing one thing at a time can be a very good strategy, and I’m quite sure there’s plenty of appetite for newer versions of Paint.NET even if they are pre-alpha bits (not the cereal!). There are a few more changes that need to go in before I feel comfortable doing this, such as fault-tolerant saving. Right now Paint.NET, when told to save, will write directly to the file you’ve already saved – it needs to save to a temporary file first, and then swap over the original file only once that has completed successfully. Anyway that’s all for now! Pre-alpha builds would be cool. My experience from using early builds of web browsers is that there’s a lot of geeky fun trying out new features and watching them evolve. The Windows Animation Manager sounds interesting, being primarily an ASP.NET developer I’d not heard of it. Have your developed your own .NET wrapper for it? Thank you! I think that Paint.NET is the best solution to image editing on Microsoft Windows. It’s very simple, but at the same time very powerful tool. I recommend it to all my friends who want to have a simple editing but they do not want to buy such a monster like Photoshop. Thanks for the consistent work! I’ve been a fan of Paint.Net since I discovered over two year ago. Wouldn’t transactional NTFS work better for fault-tolerant saving? Saving to some other file and then swapping breaks the “Previous Versions” feature and you have to manually copy various file attributes (security and encryption for example). I second this. “Previous versions” feature is very useful sometimes. I’ve implemented this so that TxNTFS is used if posible. Else, the file is saved to a temporary, then swapped over to the original via two renames and a delete. My testing shows that this preserves the Creation Date metadata (via tunneling, go look it up on Raymond Checn’s blog), and I wouldn’t be surprised if Previous Versions was happy with it. If not, then this is still preferable to clobbering all the original file data. TxNTFS isn’t available on non-NTFS volumes, or for encrypted files, among other scenarios. It is great to hear that v4 development is still driving forward! I have been using Paint.NET for graphic design and photo manipulation for some time now. Just a few weeks ago, I installed The GIMP for the first time – I was finding the lack of rendering tools on Paint.NET was preventing me from doing many things. I hope we will see the Path Select tool in PDN sometime soon.